Yesterday, Caleb grabbed a store flyer as we left the drugstore. When we got to the truck he very clearly asked for Fruit Loops, “little ones.” Today we went to the grocery store to buy him some because he’s been very persistent. He has also been a very reluctant eater in the mornings so when he agreed to eat them for “breffest,” it seemed like a good idea. At the store he lead me away from where Eric was looking at produce toward the middle of the store. I thought he might be able to find the cereal aisle though this wasn’t our normal grocery store…the layouts are all pretty similar…and he did a great job! He started only 1 aisle over and quickly found what he was looking for. I thought he would want one of those single serving bowls of Fruit Loops and they were on sale 10 for $10, cool! But my little Monkey had other ideas…he went old school..he went for a variety pack of the single boxes. He carried the cereal until we checked out and he only asked me to open it eighty billion times…you know, just your average perseveration. I thought he would tear right into the box as soon as it was unwrapped but, to my surprise, he just wanted to hold one. After a few minutes he realized that there was a second box of Fruit Loops in the variety pack and he pulled that one out, tapped me on the shoulder and said, “Sweetheart, here you go.” Awww! This is exactly why I will buy him anything he wants! Anyway, we drove home and he chatted happily to me the entire way. We talked about Toucan Sam, “izza burdy!” We talked about the fact the it was not going to snow enough for the “snowbowler.” We talked about “chilren’s hopspital.” And we talked a little more about “breffest” he assured me he was “so hongry.” Any time Eric dared to attempt to distract me he would lean forward, tap me politely on the shoulder and call me either Sweetheart or Honey. Anyone want to guess who won the battle there? If only he weren’t so dang cute, Eric might have stood a chance. When we got home I found myself juggling my stuff and Caleb’s stuff while E loaded himself down with groceries. Monkey very helpfully carried one of the boxes of Fruit Loops upstairs. Such a good helper. I made a tactical error here by asking him if he could help me, he chose no and marched off…note to self, don’t ask…tell! By the time we staggered up the stairs Caleb’s shoes were in the closet, his jacket was in the hall and everything he’d been wearing had disappeared. He sat down at his computer with his little box of Fruit Loops and turned on You Tube. I had been expecting a battle over the cereal, it was nearly dinner time so he was not going to be allowed to snack, but it was a non-issue. He just sat and watched videos while periodically adjusting the box’s location. He joined us for dinner with no problems and ate his standard single noodle before announcing he was, “all done.” Nowwwww, I thought, here comes the fight! He didn’t eat his dinner, he was not going to be allowed to snack. But, again, it was a non-issue. After begging us for Fruit Loops for 24 hours he was content to just hold them. Sometimes he’s a little odd. You might be wondering why there is a picture of Apple Jacks here since I’ve been going on and on and on about Fruit Loops. 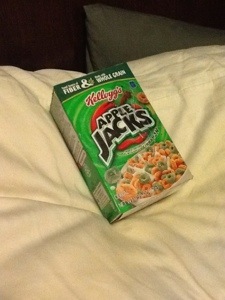 There is a perfectly reasonable explanation…Caleb took the Fruit Loops to bed with him and tucked them in right next to CEO and the pink penguin…he tucked the Apple Jacks in my bed. ← For the parents of typical kids. Leah Geisert liked this on Facebook. Angie Barrett Grantman liked this on Facebook. This was an adorable read! oh my God, that is too adorable for words!!! We would still love to get the boys together for a play date – how about April vacation? Chelsea Owens liked this on Facebook. Melanie Felix-Pena liked this on Facebook. Elizabeth Bourn liked this on Facebook. Ruth Butler liked this on Facebook. Candice Conway Simpson liked this on Facebook. Trish Ostrout liked this on Facebook. So charming! Great read. Thanks. I smiled throughout! Becky Schlitz Blackwell liked this on Facebook. Linda Trout liked this on Facebook. Sherri Cremeans liked this on Facebook. Darla Swanfeld liked this on Facebook. Mary Conkey Crippen liked this on Facebook. Diane Bentley liked this on Facebook. Very cute, but the real question is did he ever eat them? I don’t know how many boxes of cereal we bought that never got eaten:)! It was all about the picture! Rebecca Wellbrock liked this on Facebook. LOVE this!! Oh and that reminds me, Brayden is out of cereal…. Jennifer Radford Dupuis liked this on Facebook. Nancy Furman Hertzig liked this on Facebook. Erin Crawford Deely liked this on Facebook. Julia Brown Flaherty liked this on Facebook. Wesley Jackson liked this on Facebook.